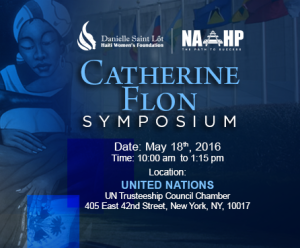 Hillside, NJ, March 8, 2016 — Commemorating Women History Month and International Women Day, the National Alliance for the Advancement of Haitian Professionals (NAAHP) and the Danielle Saint Lot Haiti Women’s Foundation are proud to announce a one-day symposium on May 18, 2016 at the United Nations headquarters, in New York City to address the role of women entrepreneurs in the development of Haiti’s economy. The Catherine Flon Symposium: Cultivating Innovation, Entrepreneurship, and Economic Empowerment will convene over 150 public and private sector leaders, current and aspiring entrepreneurs, investors, professionals and development practitioners who will engage in a public forum to assess the challenges for small business owners in Haiti and the U.S. then identify effective strategies to accelerate and sustain the growth of women-owned business enterprises in Haiti and the Diaspora. Catherine Flon is regarded as one of the symbols of the Haitian Revolution and independence from France. She sewed the first Haitian flag on May 18, 1803. “We at NAAHP strongly believe that Haitian Women entrepreneurs are essential for a healthy economic growth in Haiti and we will continue to engage them in development in Haiti,” said NAAHP President Serge Renaud. According to the U.S. Department of Commerce, there are about 8 to 10 million formal Small and Medium Enterprises (SMEs) with at least one woman owner in developing countries. Women make significant contributions to household incomes and to economic growth. Women’s economic participation has become a benchmark for economic progress in developing countries. “The women in the diaspora are dynamic and innovative leaders and this first inaugural symposium is an opportunity to harness their many talents. The Danielle Saint Lot Haiti Women’s Foundation is proud to partner with NAAHP on this timely forum to engage Haiti’s daughters in substantive dialogue and thought leadership about economic empowerment,” said Danielle Saint-Lot, president of The Danielle Saint Lot Haiti Women’s Foundation. In order to position Haiti on a path to success, girls and women must be educated; become skilled in their respective fields or industries; and equipped with the necessary resources that will enable them to successfully launch their own business to support themselves, their families, and surrounding community through job creation. Investing in women and ensuring full economic participation of the women of the Diaspora builds a stronger, more stable society, which creates a foundation for increased investment in Haiti and a path to inclusive and sustainable growth. Registration for the Symposium will open on March 15, 2016 on our Professional Development website. Opportunities for sponsorship are also available online. Founded in 2011, the National Alliance for the Advancement of Haitian Professionals (NAAHP) – formerly known as the National Association of Haitian Professionals (NAHP) – is a 501(c)3 non-profit organization established by a diverse group of forward-thinking industry experts, youth leaders, faculty, public and nonprofit sector professionals from Haiti and its global diaspora. NAHP is focused on connecting a global community of peers with career advancement resources as well as fostering transformative relationships between NAHP members and committed stakeholders to rebuild Haiti through philanthropy and social entrepreneurship. For more information about NAAHP, visit www.naahpusa.org. The Danielle Saint Lot Haiti women’s Foundation, a U.S.-based non-profit, advances programs to empower Haitian women through the promotion of social entrepreneurship, leadership skills, and professional development. The foundation’s activities include trainings, forums, networking, coaching, and mentoring. Among the topics explored are gender equality and conflict resolution to advocate for greater equal social and economic rights for women. The goal is to give women the necessary tools to help them improve the quality of life of their families and communities. The Foundation’s initiatives are implemented in Haiti. For more information about the Foundation, visit www.haitiwomensfoundation.org.